End weight stigma — that's the focus of this year's World Obesity Day, observed on Oct. 11. It comes as a recent study showed parents who urge their kids to diet may not only be condemning their own children to be overweight or to have eating disorders; they may also be dooming their grandchildren. The findings support what much other research has shown: Weight-shaming kids doesn’t encourage healthier habits and can instead hardwire a vicious cycle of binge-eating, skipping meals and a lifetime of self-loathing. “Furthermore, the negative effects of parent encouragement to diet can compound over time, not only impacting the person directly receiving the messages, but also potentially hurting generations to come,” Jerica Berge of the University of Minnesota Medical School and colleagues wrote in their report, published in the journal Pediatrics. Their study of teens who grew up to be parents themselves found that those whose parents encouraged them to diet were more likely to be obese and to have eating disorders. And years later, when they had kids of their own, they made the same mistakes. Parents may think they are helping their children by telling them the hard truth, but even those who manage to lose weight hate their bodies, the study found. “Experiencing parent encouragement to diet as an adolescent was significantly associated with a higher risk of overweight or obesity, dieting, binge eating, engaging in unhealthy weight control behaviors, and lower body satisfaction 15 years later as a parent,” Berge’s team wrote. “My mother constantly gave me diet advice, and I can still hear her voice in my head 40 years later,” said Michelle, a Washington, D.C. writer who did not want to give her last name because she has a teenage daughter. “The only time she approved of my weight was when I was literally starving myself. Looking back, I can remember exactly what I weighed, and I was close to being underweight,” said Michelle, who is now 58. Yet Michelle remembers thinking herself fat even when her body mass index (BMI) fell to 18.5 — the lowest limit of what is considered healthy for her height. "I wish I could have seen myself then as I look back and see myself now," Michelle said. "Now I really am overweight and still hate myself when I look in a mirror." “He was using really hurtful terms to describe his daughter’s body appearance." The findings didn't surprise Dr. Albert Hergenroeder, chief of adolescent medicine at Texas Children’s Hospital in Houston. He sees children with eating disorders every day. “We have pre-teens, teens and kids who are of normal weight who perceive that they are overweight and they come in malnourished by any standards,” said Hergenroeder, who was not involved in the study. Many are of completely normal weight but have a distorted body image, he said. “Some of this comes from the parents, so we have to work with them separately,” he said. Can you really be obese and healthy at the same time? Some medical experts fear the term “healthy obesity” discourages doctors and patients from thinking about weight loss as a way to prevent disease. Hergenroeder described the case of a young athlete whose father had also been an athlete and who wanted his daughter to be thin. “He was using really hurtful terms to describe his daughter’s body appearance,” Hergenroeder said. “Chunky” was one, he said. “Let’s think of the kinds of words you don’t want to say to your daughter,” he said. For their study, Berge and colleagues followed 556 people who were teens in 1998-1999 and then again in 2015-2016. They had previously found that nearly 40 percent of parents admitted they encouraged their children to diet — even children as young as 2. That’s even though there is plenty of research to show that such encouragement backfires. Kids told to diet will starve themselves, binge-eat and will learn to hate their own bodies. 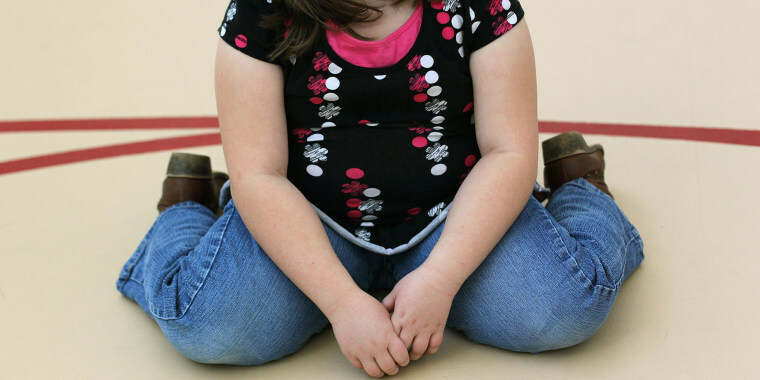 With 40 percent of America's kids considered obese, it's clear that parents are doing something wrong. But research shows that telling kids they are too fat does not work. never complaining about their own bodies. Amy Greene says that is just what her mother did, with great success. “She projected a healthy image about food. We never talked about getting fat,” said Greene, a Silver Spring, Maryland social worker. The same is true of her three sisters, said Greene, who says she enjoys regular exercise including running and weight-lifting. “None of us have eating issues at all. That’s four daughters — none of us diet,” said Greene. “We never talked about dieting in general. She never said ‘Don’t eat that — you’ll get fat’." But Greene's mother also did not tempt her girls with junk food. "She never brought a lot of sweets into the house. We did not get dessert every night," Greene said. Instead, they just ate good food, said Greene, who says she has never struggled to keep at a healthy weight. “I like how I eat. Maybe some weeks I have a lot of ice cream but I don’t obsess about it,” she added. That doesn’t mean she doesn’t look at herself critically in the mirror, Greene said. “To say that I don’t worry about my weight would be a lie. I think every woman does,” she said. But she tries to keep up the same healthy food attitudes with her two sons. And her mother passed on other wise advice about weight, Greene remembers. “The one thing that always struck me though she always said you should never comment about somebody else’s weight,” said Greene. That’s a good habit to keep with children, too, Hergenroeder said. Kids are already hypercritical of their own bodies. In the last century, it was fashion magazines. Now it’s websites and a selfie culture that drive children to want to be “perfect”, Hergenroeder said.